Cargolux Airlines announced that the airline has added a new direct service from Hong Kong to Columbus, Ohio, effective from 16 June. At the same time, Columbus becomes the latest airport in the network to be served with Cargolux’s new 747-8 freighters. Cargolux will operate two weekly flights on the route. Cargolux was able to draw on the valuable support of forwarding company Hellmann Worldwide and the Columbus Regional Airport Authority in establishing the flight. ‘We are pleased that we are expanding our North American network by adding Rickenbacker International Airport to our global portfolio of destinations’, said Richard Forson, Interim President and CEO of Cargolux. The airport infrastructure and service is very accommodating for air freight operators and well adapted to the needs of the 747-8F, Forson added. The Columbus Regional Airport Authority and its three airports, Port Columbus International Airport, Rickenbacker International Airport and Bolton Field Airport, as well as select businesses located at Rickenbacker Inland Port, accounted for US$6.6 billion in total annual economic output in 2012. Cargolux serves Rickenbacker International Airport with its 747-8 freighters. The airport handled a total of 22,755 tonnes of cargo in the first four months of 2013. Columbus is one of the major fashion and apparel markets in the world and home to a number of large international fashion companies. 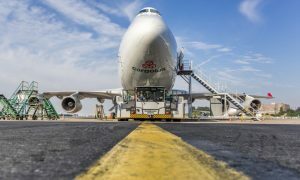 The direct Cargolux flight from Hong Kong offers shippers of fashion goods and other commodities fast and convenient connections from Asia to this market. Rickenbacker is dedicated to air cargo shipments, focused on serving the freight industry and, thus, ideal for Cargolux, whose customers welcome and appreciate the reliable service. Utilizing its advanced fleet of Boeing 747-8 freighters, Cargolux can easily meet the needs of the market, offering additional capacity in line with growing demand.